Researched Nutritionals CoreBiotic™ represents the latest in advanced probiotics, combining 3 fully sequenced and registered soil based strains with an organic prebiotic to promote colonization. Each of the strains were specifically chosen for their supporting science. CoreBiotic™ is our most comprehensive and advanced probiotic to date. The human microbiome is a diverse group of metabolically active microorganisms that play a crucial role in maintaining health. These microorganisms contain their own genome that continually interact with the human genome. Through this interaction, the microbiome becomes an integral component of the immune system in promoting a healthy inflammation response. Many physical and neurologic inflammatory conditions have been shown to have a disruption in the microbiome1. Managing the gut microbiome is essential for the immune system to support positive long-term health outcomes. The development of probiotic formulas has moved beyond including general groups of organisms to using specific strains. 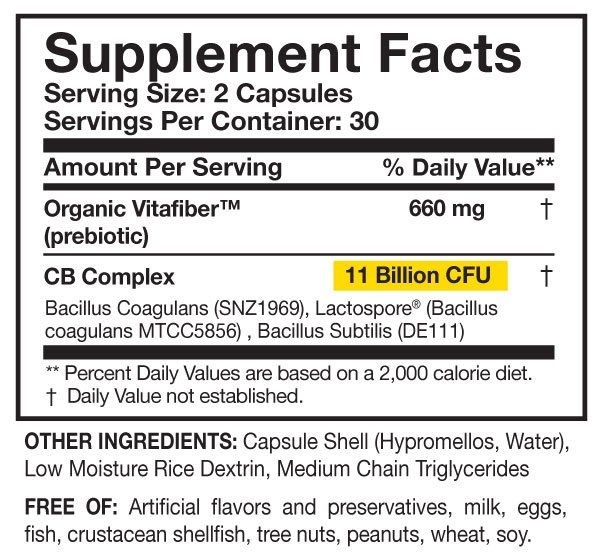 Previous probiotic formulations might have listed bacillus subtilis for example without identification of the specific strain number. Advanced formulations include only those probiotics that have been identified by genomic sequencing and are registered with a specific strain number. Only these strain-specific probiotics have undergone rigorous genomic studies; guaranteeing accurate specificity and potency. Spore forming probiotics (also known as soil based organisms or SBO’s), are derived from the soil. Traditionally when people consumed organic produce, they ingested soil-based probiotic organisms. These SBO’s helped maintain a normal microbiome in the intestines. Today with processed foods containing pesticide and hormone residues, people do not consume these beneficial SBO’s, leading to dysbiosis or microbial imbalance. Because SBO’s are spore forming, they are heat stable, dairy-free, and able to withstand stomach and bile acid. This allows them to pass into the intestines without degradation. Once in the intestines they leave the spore form and produce lactic acid which has natural antibacterial properties to prevent growth of pathogenic bacteria. This competitive inhibition helps the beneficial probiotic bacteria proliferate. Capsule Shell (Hypromellos, water, low moisture rice dextrin, medium chain triglycerides. Free of: Artificial flavors and preservatives, milk, eggs, fish, crustacean shellfish, tree nuts, peanuts, wheat, soy.